The Center for Research Libraries will purchase six valuable microform and reprint collections through this year’s Purchase Proposal Program, with a list price value of $220,987. These sets will soon be available through interlibrary loan from CRL. Many major microform and reprint sets and collections can be too costly for individual institutions to purchase, and are not usually available through interlibrary loan. Through the CRL Purchase Proposal Program, libraries nominate microform and hard copy collections for CRL purchase. Participation in this cooperative acquisitions program is one of the benefits of a CRL membership. 185 reels; $13,000 [depending on currency exchange rate]. 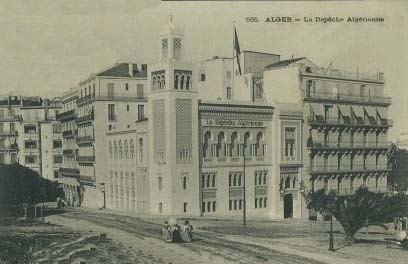 La Depeche Algerienne: journal politique quotidian is a political newspaper from Algeria. This conservative daily was one of the highest-circulating papers of its time in the former French colony. This collection consists of the Church Missionary Society’s records, correspondence, biographies, news, minutes, papers, diaries, and pamphlets relating to missions. It provides descriptions of medical works, education, social welfare, and the spread of Christianity in the regions. Part 12: The CMS Juvenile Instructor, 1842–1890, Children’s World, 1891–1900, and The Round World, 1901–1958; 25 reels. Part 13: CMS Collection of Lives of Missionaries held at the Church Mission Society Library; 15 reels. Part 14: CMS Collection of Lives of Missionaries held at the Church Mission Society Library; 14 reels. Part 15: The Church Missionary Society Record, 1830–1875, held at the Church Mission Society Library; 23 reels. Part 16: CMS Awake! - A Missionary Magazine for General Readers, 1891–1921, continued as Eastward Ho!, 1922-1940; 13 reels. Part 17: CMS Minutes, 1876–1898, and Indexes to Minutes, 1875–1907; 24 reels. Part 18: CMS Minutes, 1898–1949; 27 reels. Part 19: Papers of Henry Venn (Secretary of CMS, 1841–1873) and Family; 19 reels. Part 20: Papers of Henry Venn (Secretary of CMS, 1846–1873) and Family; 20 reels. Part 21: Diaries of Dr Max Warren (General Secretary of CMS, 1942–1963) and Family; 16 reels. Part 22: Pamphlets; 14 reels. Vietnamese newspapers in French and Vietnamese from the Bibliotheque nationale de France. La Depeche d'Indochine. Quotidien independent. Saigon: [s.n. ], 13 March 1928–1 Jan 1940; 73 reels. France-Indochine: journal quotidien. Hanoi: [s.n. ], 2 Feb 1922–June 1925 and Jan 1926–14 Dec 1940; 63 reels. Thuc nghiep dan bao. Ngay nao cung xuat ban tru chu nhat ngay le va ngay tet [later "Journal quotidien; Quotidien d'information et d'opinion en langue annamite], Hanoi: [s.n. ], 2 Feb 1922–24 Sept 1933; 32 reels. Trung hoa nhat bao. S.I. : [s.n.? ], 12 Sept 1923–31 Dec 1942; 23 reels. Hanoi-Soir. Quotidien d'informations illustrees, Hanoi: [s.n. ], 29 June 1938–31 Dec 1943; 19 reels. L'Ami du peuple: quotidien independent. Saigon: [s.n. ], 1 July 1930–26 Dec 1935; 12 reels. Le Colon francais republicain. Journal de defense des interets francais et annamites. Haiphong: [s.n. ], 22 Dec 1925–6 Dec 1934; 9 reels. Tieu Thuyet chu nhat. Hebdomadaire recreatif paraissant le dimanche. Hanoi: [s.n.? ], 2 Aug 1931–11 Sept 1940; 7 reels. Ha thanh ngo bao (Continued by Ngo bao after Aug 14, 1931). Indochine: [s.n.? ], Jan–June 1931 and July–Dec 1932; 2 reels. Indo-radio. Organe hebdomadaire indochinois d'informations radiophoniques. Saigon: [s.n.? ], 12 May 1937–19 Sept 1943; 6 reels. Quoc gia [La Nation]. Hanoi: [s.n. ], 1940–1942; 4 reels. Trong Khue Phong. Phu truong Phu nu, cua Tan A Tap Chi. Saigon: [s.n. ], Feb 1934–1938; 4 reels. Trung tam. Tuan bao ra ngay thu tu [later "Tuan bao van chu'ong va trao phung"]. Hanoi: [s.n.? ], 7 Nov 1934 (N4) –23 May 1935 (N6); 4 reels. L'Essor indochinois. Saigon: [s.n.? ], 5 July 1924–17 Sept 1927; 1 reel. L'Indochine nouvelle. Revue hebdomadaire illustree... Saigon: [s.n.? ], 21 July 1934–11 May 1935; 1 reel. Le Peuple. Journal bi-hebdomadaire. Indochine: [s.n.? ], 30 Nov 1930 (A1, N1) - 7 Dec 1930 (A1, N3); 1 reel. Hoa Bao. Saigon: [s.n. ], 1932–1933, 1932/12 - 1933/01; 1 reel. Minh nong. Xuat ban moi thang hai ky. (Alternate title: Minh nong quang chi) Nam-dinh: [s.n.? ], 1 April 1933 (N1) –15 April 1933 (N2); 1 reel. Nu gioi. Tua bao... Saigon: [s.n. ], 5 Dec 1938–1 Dec 1939; 1 reel. This microfilm set released in 2012 presents documents from the Public Housing Administration that extend back to the establishment of federal public housing. The publisher’s description notes that this collection includes directives and memoranda related to the Public Housing Administrations policies and procedures. Among the documents are civil rights correspondence statements and policy about race, labor-based state activity records, local housing authorities’ policies on hiring minorities, court cases involving housing decisions, racially restrictive covenants, and news clippings. The intra-agency correspondence consists of reports on sub-Cabinet groups on civil rights, racial policy, employment, and Commissioners’ staff meetings. Archives of the Imperial Household Agency of the Qing dynasty. The collection contains 320 reprinted volumes from the collection held at the First Historical Archives of China. The Imperial Household Agency was—with 3,000 people—the largest political organization in the Qing dynasty. It managed the Imperial household including its food, apparel, library storage, etiquette, construction, farming, animal husbandry, security, hunting, salt administration, and some collections of taxes and tribute. It consisted of seven agencies and three boards and had more than 30 affiliated agencies, such as one for textile production. The archival files included here are copies of the memorials on Interior Affairs as presented to the Emperor and his decisions based upon those reports, collated in book form for the archives. Its main contents are: the palaces, palace renovations, silver holdings, the appointment and removal of officials, reward and punishment, wedding events, foreign tribute, gifts, sacrifices, the tracking down of escaped eunuchs, inventories, etc. MSU PhD fellow used South African newspapers preserved by the Cooperative Africana Materials Project (CAMP) to research and map black consumerism.